Ever since I did this post on round mirrors: here, I've been daydreaming about the 2nd last mirror in that post. It is such an absolutely stunning mirror I can't get it out of my mind. 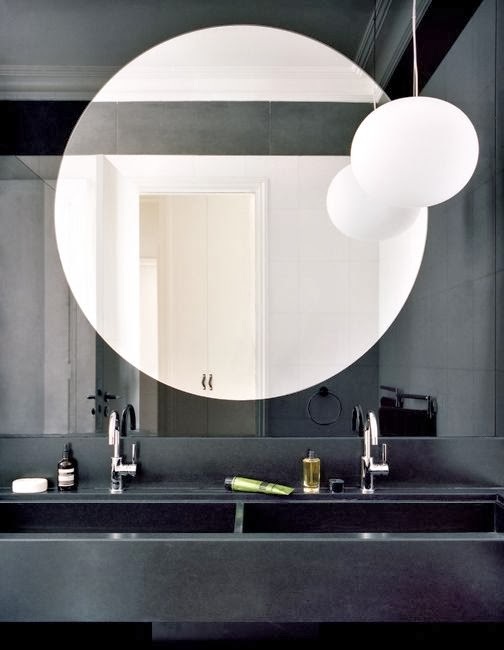 I think I've become obsessed with the idea of a really, really big oversized round mirror over the bathroom vanity. There is just something so chic about the look, I love it. I've pulled together a bunch of photos of big round mirrors to see what you guys think. As usual I've got a few opinions about the look. 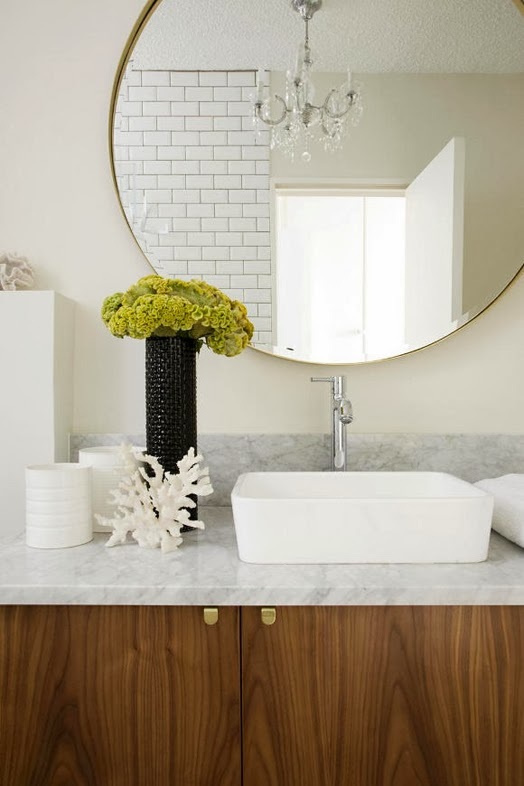 Getting down to the nitty gritty details, I like an oversize round mirror paired only with a one sink vanity or each sink needs to have it's own large round mirror. 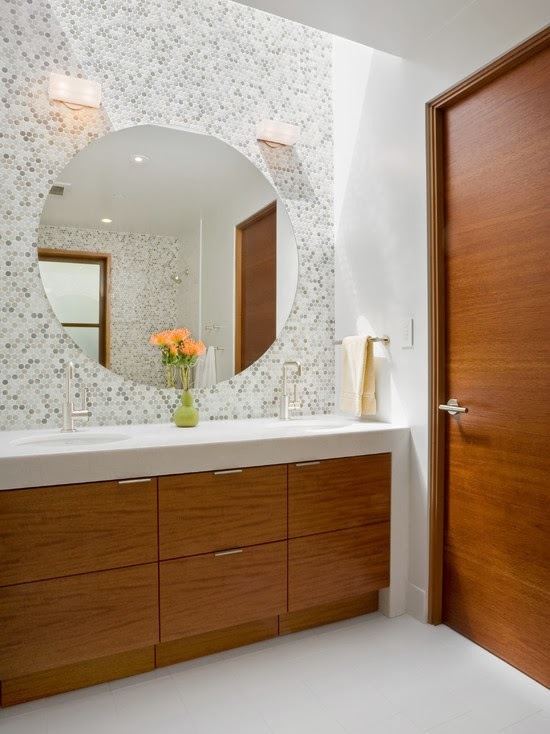 Some of these photos feature one big round mirror hanging over two sink vanities. 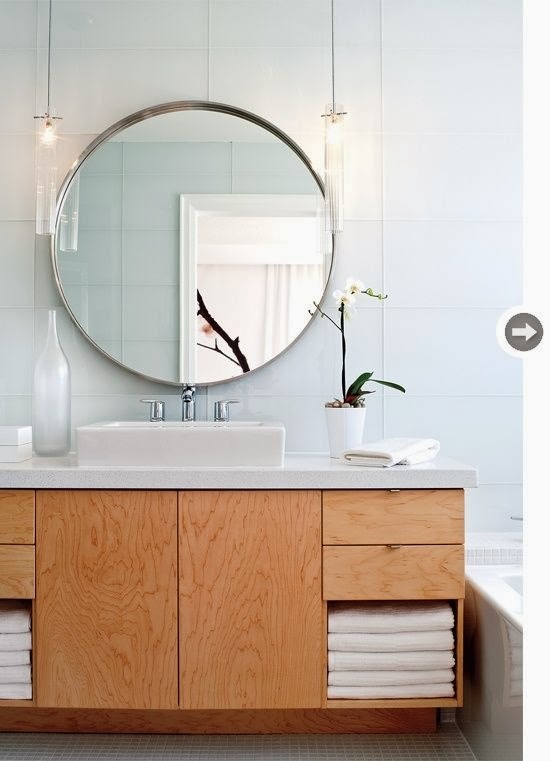 It looks nice in the photos, but I just don't like when a vanity mirror doesn't cover the entire sink area of each sink. Imagine standing in front of your sink brushing your little pearly whites, looking in the mirror, checking out the dark circles under your eyes and in order to see your entire face you need to lean sideways! Nope, doesn't work for me. I want to see how bad my entire face looks in the morning, not just half of it! 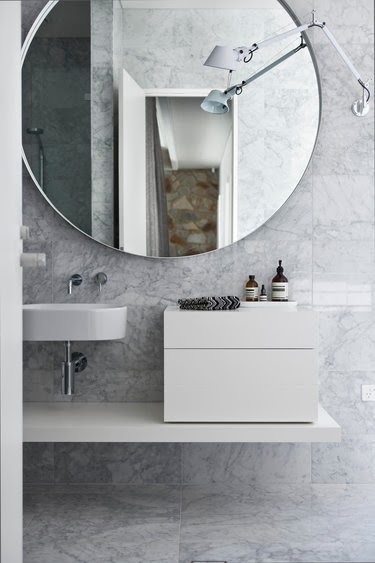 See for yourself, imagine standing at the sink on the left in the first photo, you'd have to lean to your right to see any of your face in that big circular mirror! And what about for this gorgeous giant mirror bellow? I'd feel all off center looking in this mirror, sure you'd see your whole face, but half your side would be cut off. 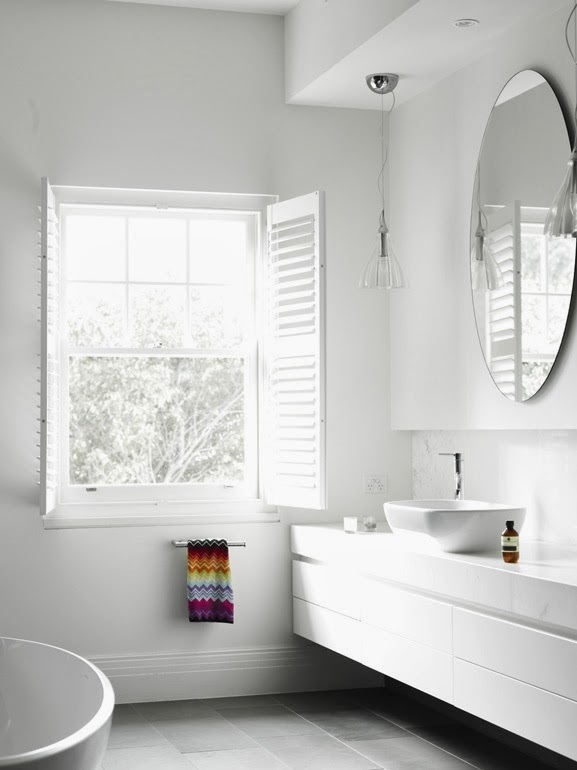 When it comes to bathroom (and kitchen design too), I think functionality is absolutely key. No matter how gorgeous a design is, if it affects your ability to get ready when in a rush or you need to constantly adjust yourself to work in the space, you are going to be bleeped off and see the cool design as a nuisance. No matter how gorgeous something is if you have to change the basic way you do things to work around it, the design is simply not worth doing as you'll grow to hate it pretty quickly. 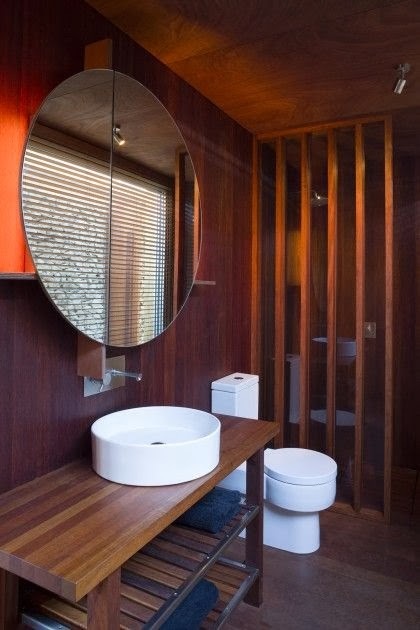 Now this is perfect, one sink plus one giant round mirror. 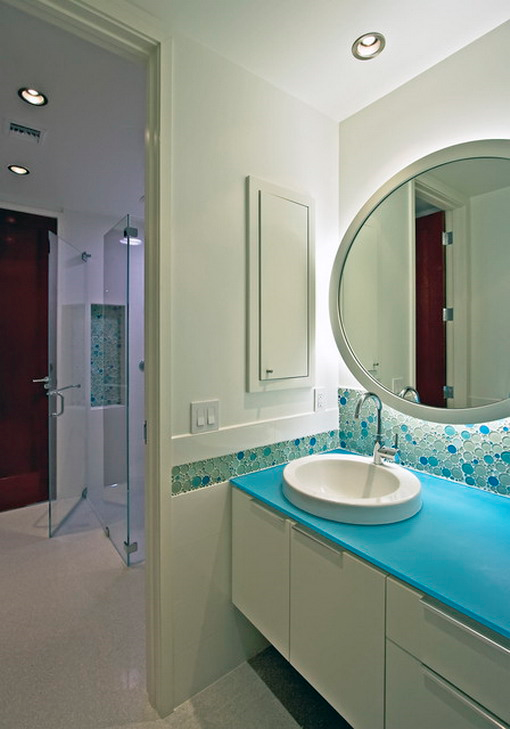 Here's another example of the 2 sink vanity paired with the one large round mirror. 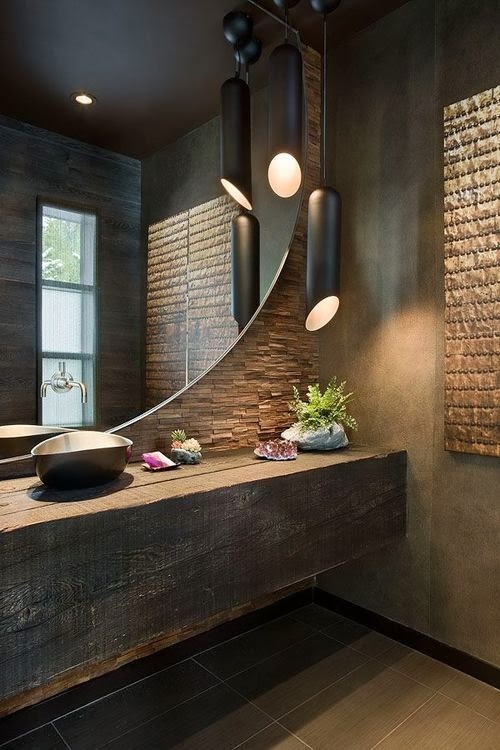 It looks gorgeous yes, but you can't even see yourself in the mirror if you are standing in front of your sink. What's the point of that? To practice cha-cha-ing left and right while you brush your teeth? Now this next mirror is fab. take a look at the ceiling, it actually stops straight. No big deal, it still looks great. I also loved this one, ok, it's a bit more on the oval side but I love how it makes the room feel very tall. 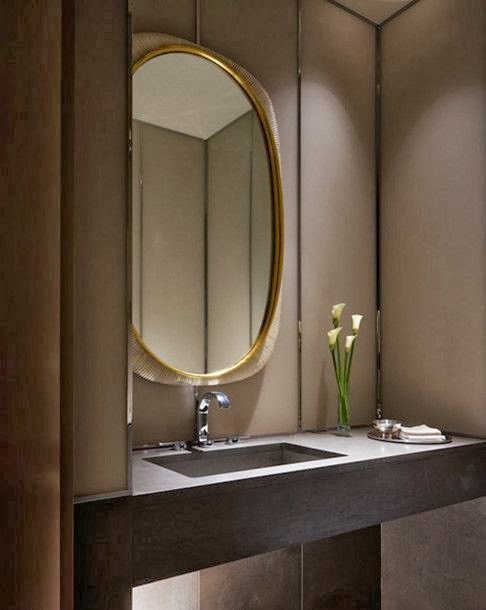 The vintage gold frame and the additional little trim around the edge of the mirror adds a nice texture element to the bathroom. 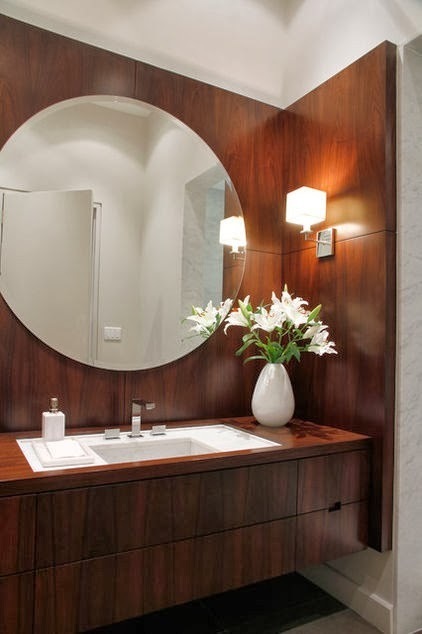 check out a post on the different wall looks to pair with a large round mirror. And let me know in the comments if you think I'm being too uptight about the 1 mirror 2 sinks thing. I want to know!